Bajaj Pulsar NS 160 which had always been complained about the lack of a rear disc and meaty tyres, has finally now got updated with these most concerned features. Besides, no changes are made to the aesthetics and mechanical front. In order to possess this improved yet more safe naked street, one has to shell out a premium amount of INR 4,500 over the regular 130mm rear drum brake model, i.e. INR 87,124 (ex-showroom). Neither the Bajaj Auto updated its official website with this new rear disc trim nor it made any official announcement of its launch. 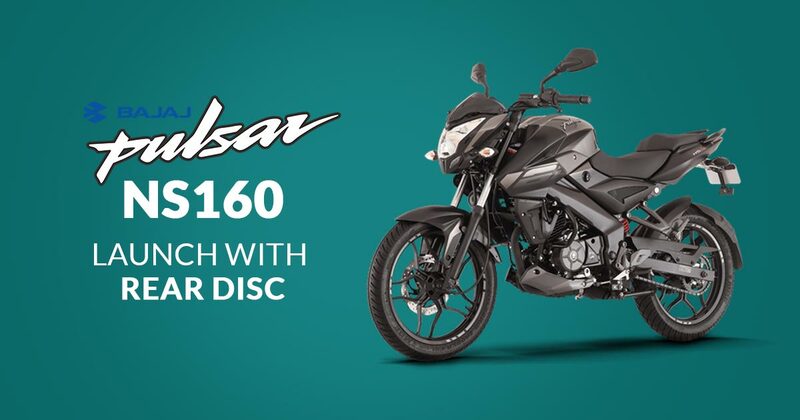 Though, the new rear disc Pulsar NS 160 is being promoted on social media. Well, it’s not surprising for those who are aware of Bajaj’s strategy of silently introducing products to existing lineup. The brand has always been proactive at updating products with new colours and variants of existing motorcycles. whether, this time besides the addition of this significant equipment, the bike did not receive any visual or graphics change. Packed with a new 160cc, 4-valve, oil-cooled engine that is claimed to be the most powerful in the segment, the NS 160 uses 15.5 HP and 14.6 Nm, of belt out power and torque through the mated gearbox unit. This new variant now sits on fatter tyres, 90/90/17 at the front and 120/80/17 at the rear, similar units being offered with the Pulsar 220. In the segment, the Pulsar NS 160 with a rear disc is aimed squarely at modern 150cc motorcycles like the Honda CB Hornet 160R, Yamaha FZ and the Suzuki Gixxer. Mind you, the Yamaha FZ does not feature this hardware (a rear disc brake). Currently, the company is busy updating its Pulsar lineup and so, apart from the new Pulsar NS 160 rear, we could also witness a few other updated models in the coming future. With the newly introduced Pulsar NS 160, the brand is hoping to receive a hike in revenue generation, major share contributed by Pulsars.